I have no idea why I haven't read Dennis Lehane yet!! Must get this book...!! I've never read Gone, Baby, Gone, but I really need to read it. Do I have to read that one first before this one? Great review Michelle! I liked it too, but not as much as some of his other books. LOVE BOSTON too! I've actually never read a Lehane book but have really been wanting to! I saw Gone Baby Gone before I realized it was a book and really liked that too... brought up some very interesting questions! Boston is my sweetie and I's escape place, love it. We enjoy staying in Back Bay near Newbury Street. I have only read Shutter Island but would like to try another by DennisL. Agreed on the read before you see it...though the only book of this particualr author's that I've read is SHUTTER ISLAND. Definitely enjoyed the book...the movie, well it was okay, but the ending...egad! Why or why do they feel the need to twist things more than they already are?! Sounds like this one delves into the past a bit but also offers much action....can't say it's quite for me, but I can certainly see the draw. Thanks for sharing! 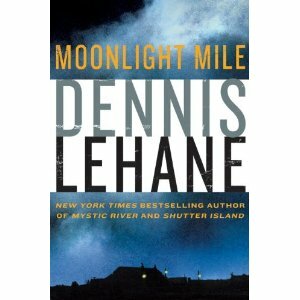 I had not read any of Lehane's work before this one, although Mystic River was a fave movie of mine (heck, I didn't even know the movie was based on a book, or I'd have read the book first). After reading this one, the next day I stepped into a local indie bookstore and picked up another title of his! I thought this book was fun, so I had to read more! The dialogue in this book is what hooked me. It made me laugh out loud. Hilarious.